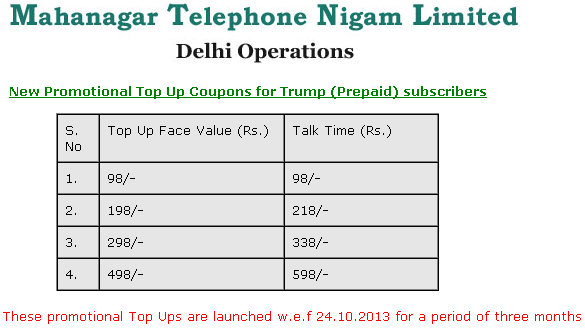 Mahanagar Telephone Nigam Ltd (MTNL) announced the launch of Full & Extra Talk Time offer starting from Rs.98 for its ‘Trump’ prepaid customers (2G and 3G) in Delhi and NCR circle to commemorate the upcoming festival. 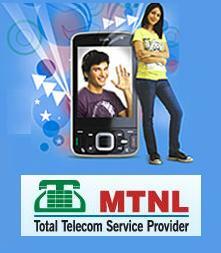 MTNL has come up 4 new top-up voucher, priced at Rs.98,Rs.198, Rs.298 and Rs.498. Top-Up -98 enables its customer to enjoy full talk time of Rs.98 as core balance. While Top-Up 198, 298 and 498 provides extra or hyper talk time of Rs.218, Rs.338 and Rs.598 as main balance respectively. The above new Special Top-Up will be available up to 3 months from 24th October,2013 for Prepaid subscribers in Delhi-NCR circle through E-Recharge system only. For more details dial 1503 / 9868112345 (toll-free from MTNL). MTNL delhi is a waste network. No 3g coverage and very poor 2g coverage. i was enjoying good voice clarity until Cellone Up west network. However , when i entered Ncr, and my phone latched onto Dolphin, i started facing problems of voice cracks and bad coverage. MTNL must seriously improve its services. BSNL plans and services are much better.